Two new beers made with 100 per cent West Australian barley will lead Gage Roads’ beer offer at Optus Stadium in Perth. 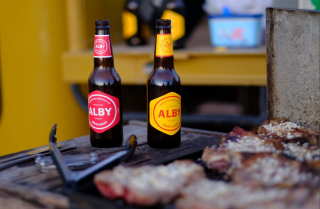 The 4.2 per cent Alby Draught and 3.5 per cent Alby Crisp are “classic no fuss West Australian lagers”, managing director John Hoedemaker told investors in his annual AGM address. The beers pay tribute to The Albion Brewery, which poured WA’s first beer in 1837, according to a new stand alone website for the Alby brands. “Over 175 years later, we raise a glass to WA’s original brewery by naming a beer after it,” the website says. Hoedemaker today said the beers are already being seeded into retail and the on-premise, with a media and consumer launch coming in the next few weeks. The management of the new Perth stadium this week confirmed that the general admission areas would be restricted to mid-strength beers. Full-strength products are allowable in premium hospitality areas. Hoedemaker today said Single Fin, Little Dove, Sleeping Giant and Atomic will be part of the product mix at the stadium. During FY17, Gage Roads grew volumes of its proprietary brands from 2.8 million litres to 3.4 million litres, Hoedemaker said. He said the brewer’s EBITDA per litre increased from 23 cents to 33 cents over the period. Investors at the AGM approved a resolution for the company to issue more shares equal to ten per cent of its issued capital at a later date. Gage Roads shares were down four per cent at the time of writing, trading at 7.2 cents.